The book of Revelation refers to the ‘lamb’ about 30 times. The use of the lamb as a Messianic term is rare in the New Testament outside Revelation. Paul referred to “Christ, our Passover” (while “lamb” is not stated it may be implied as he “has been sacrificed”). Peter also used lamb imagery: “you were redeemed … with the precious blood of Christ, a lamb without blemish or defect”. Acts quotes from Isaiah: “He was led like a sheep to the slaughter and as a lamb before the shearer is silent, so he did not open his mouth.” The Fourth Gospel has John the Baptist saying of Jesus: “Look, the Lamb of God, who takes away the sin of the world!” In Christian tradition the lamb is a frequent image for the expiatory work of Christ, drawing on these New Testament references. However, Geza Vermes has pointed out that the title Lamb of God in John 1 does not necessarily refer to the metaphor of a sacrificial animal. He argued that in Galilean Aramaic the word טליא talya literally means “lamb” but had the common meaning of “male child”. Vermes argues that in John it is a term of endearment where “Lamb of God” could have been a colloquial way of saying “Son of God”. טליא can also mean “servant”, so there may be an allusion here to the servant of God in Isaiah 53 who was also a lamb. 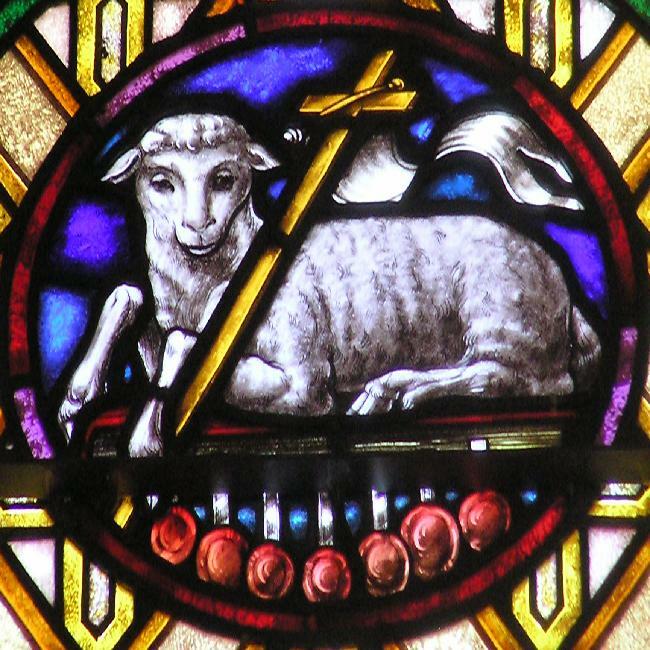 While Revelation does make use of a “slain lamb” imagery it appears that “the Lamb” is primarily used as a messianic title, rather than being a metaphorical reference to an atonement victim. For example, chapters 19 and 21 refer to the Lamb’s marriage and to his bride, with no hint of a sacrificial lamb analogy. “And I saw that a virgin was born from Judah, wearing a linen stole; and from her was born a spotless lamb. At his left there was something like a lion, and all the wild animals rushed against him, but the lamb conquered them, and destroyed them, trampling them underfoot” (19:8). “You, therefore, my children, keep the Lord’s commandments; honour Levi and Judah, because from their seed will arise the Lamb of God who will take away the sin of the world, and will save all the nations, as well as Israel” (19:11). “Through you will be fulfilled the heavenly prophecy concerning the Lamb of God, the Saviour of the world, because the unspotted one will be betrayed by lawless men, and the sinless one will die for impious men by the blood of the covenant for the salvation of the gentiles and of Israel and the destruction of Beliar and his servants” (3:8). The roots of this imagery in Revelation are therefore likely to be in the apocalyptic books of 1 Enoch and The Testaments of the Twelve Patriarchs. Acts 8:32, quoting Isaiah 53:7 Strictly speaking, the reference here is to a sheep/lamb being led to its shearers or for slaughter, but not necessarily being led to the altar as a sacrificial victim. The metaphor (“like a sheep to the slaughter, and as a lamb before the shearer“) were both in reference to the sheep/lamb being “silent“, “so he did not open his mouth”. We should not push the metaphor beyond what the writer clearly intended. The sheep/lamb was “before the shearer”, not “before the priest”. The metaphor here is about being silent like a sheep, not being sacrificed as an offering. The feminine טליתא talitha, literally “ewe lamb” and figuratively “girl” is found in Mark 5:41. Both 1 Corinthians 5:7 and 1 Peter 1:18-19 allude to the Passover lamb. 1 Corinthians refers explicitly to “Christ our Passover, an allusion to freedom from Egyptian slavery which Passover celebrates (and in the context of the 1 Peter reference it is probably freedom from “the empty way of life handed down to you from your forefathers”). The Passover lamb was not sacrificed as an atonement or for the forgiveness of sins. The “slain lamb” metaphor could not be a reference to the Day of Atonement when Israel’s sins were forgiven and blood was sprinkled on the Ark of the Covenant in the Most Holy Place, because it was a goat that was slain on the Day of Atonement, not a lamb. For the daily sin offerings bulls and goats were most frequently sacrificed. Hence Hebrews makes the point that “it is impossible for the blood of bulls and goats to take away sins” (10:14). If a lamb was offered it had to be a female lamb (e.g. Lev 4:32; 5:6). Lambs were also offered as burnt offerings, but when they were offered they were distinguished from sin offerings (e.g. Lev 12:6 “a year-old lamb for a burnt offering and a young pigeon or a dove for a sin offering”; Num 6:14 when a Nazirite completed his vow he was to bring “a year-old male lamb without defect for a burnt offering, a year-old ewe [female] lamb without defect for a sin offering, a ram without defect for a fellowship offering …”). Burnt offerings and fellowship offerings were not for atonement or forgiveness of sins. O’Neill translates this “and he was at (her) left hand like a lion” (O’Neill, J.C., “The Lamb of God in the Testaments of the Twelve Patriarchs”, Journal for the Study of the New Testament 1979 1: 2, 5).